I wouldn't trust my teen's driver training with anyone else. We wanted the best for our family and SafeWay delivered. SafeWay Driving is both convenient and profressional. SafeWay Driving was founded in 1973 for the purpose of “Preventing the Phone Call Nobody Wants”. We are not your average driving school, but continue to revolutionize the driver training industry through our proven, proprietary SafeWay Driving System. Only SafeWay Driving can provide you the peace of mind that comes from having received the best driver training in Texas. We respect how busy you are, but we also know you want what’s best for your family or employees without sacrificing the quality of your driver training services. 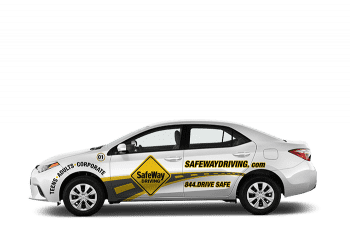 SafeWay Driving offers you the convenience of engaging, disciplined online courses integrated with the very best professional in-car training in Texas. Your local SafeWay Driving Instructors have gone through a rigorous training and certification program to achieve the designation of being “S.A.F.E. Certified”. They are held to a very high standard, licensed by the State of Texas and certified through SafeWay University to provide you the very best in-car training. Put their expertise and experience to work for you developing your driving skills. Today’s roadways are more dangerous than they have ever been. With the combination of increased distractions, overcrowded roadways and the higher number of 18-wheelers on our freeways, it’s more important than ever to have a structured driver training program to prepare you for getting behind the wheel. We have created unique driving tracks designed to prepare you for today’s challenging roadways. Driving is the only dangerous thing most people do every day. Learning to drive is not a rite of passage, an online game or cool app. It’s a learned skill-set. You don’t become a safe driver by getting a drivers license, you become a safe driver by spending hour of time practicing in the car with a certified professional driving instructor. The National Driving Standard recommends a minimum of 10 hours of in-car training with a certified professional along with additional at home practice. Need Help Selecting the Right Package?